Each day I receive a range of links to blogs posts and web tools. A post from the ABC (18 January) alerted me to James Fowler, Jaime Settleb, and Nicholas Christakis’ work, Correlated genotypes in friendship networks. Their paper encouraged me to think about linking, connecting and sharing. It is well known that humans tend to associate with other humans who have similar characteristics, but it is unclear whether this tendency has consequences for the distribution of genotypes in a population. Although geneticists have shown that populations tend to stratify genetically, this process results from geographic sorting or assortative mating, and it is unknown whether genotypes may be correlated as a consequence of nonreproductive associations or other processes. Here, we study six available genotypes from the National Longitudinal Study of Adolescent Health to test for genetic similarity between friends. Maps of the friendship networks show clustering of genotypes and, after we apply strict controls for population stratification, the results show that one genotype is positively correlated (homophily) and one genotype is negatively correlated (heterophily). A replication study in an independent sample from the Framingham Heart Study verifies that DRD2 exhibits significant homophily and that CYP2A6 exhibits significant heterophily. These unique results show that homophily and heterophily obtain on a genetic (indeed, an allelic) level, which has implications for the study of population genetics and social behavior. In particular, the results suggest that association tests should include friends’ genes and that theories of evolution should take into account the fact that humans might, in some sense, be metagenomic with respect to the humans around them. On the same day I found the genotype paper I received a link from a friend to a Linked Data post. I noted too that week 3 of LAK11 is focusing on the Semantic Web, Linked Data, and Intelligent Curriculum (the syllabus is here). I am missing LAK11 as I am CCK11. Week 5 of CCK11 is discussing Groups, Networks and Collectives. Diigo lists have become an invaluable resource for me too. I am tracking the Diigo Community Group; a Teacher-Librarian Group; a Plurking Educators’ Group; a Web 2.0 Group: and a Web 2.0 Tools’ Group. In the last year I have been exploring ecology metaphors of sharing and post regularly about items that resonate with me. 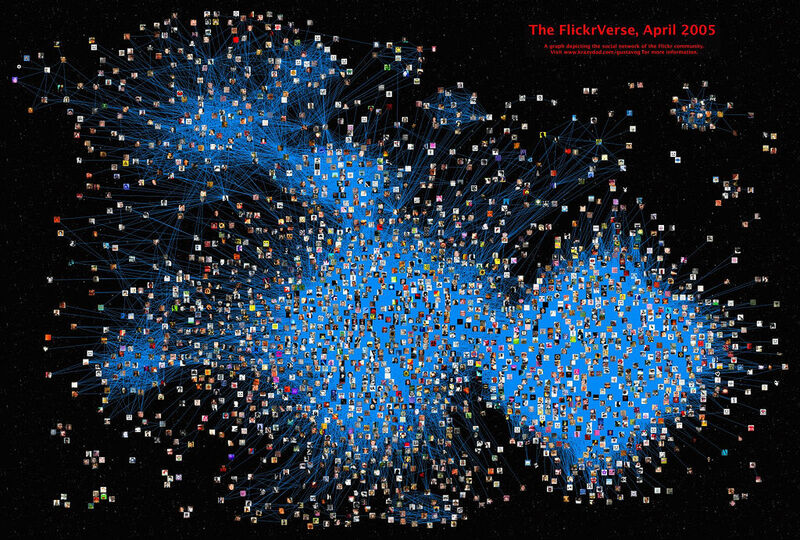 I am becoming interested increasingly in the visualisation of networks. Thanks to James, Jaime and Nicholas I am off to read Erez Lieberman, Christoph Hauert and Martin Nowak’s paper on Evolutionary Dynamics on Graphs and to ponder the friendship possibilities of such dynamics. I am sorry that I am not at the Recent Changes Camp in Canberra this weekend. However I will follow their wiki as a peripheral participant.